BEYONCE has deflected a question about her rumoured pregnancy. The 'Grown Woman' singer - who has a 14-month-old daughter Blue Ivy with her rapper husband Jay-Z - played coy during a TV interview regarding speculation she is expecting her second child, joking that she hadn't heard about the rumours. Quizzed about reports she is pregnant at the Sound of Change charity concert in London on Saturday (01.06.13), she said with a laugh: "What kind of rumours? What? Huh? I don't know what you're talking about." After the interview for the 'Today Show' - which aired in the US Monday morning (03.06.13) - host Savannah Guthrie said: "Mystery remains unsolved." Although Beyonce, 31, and Jay-Z, 43, have remained tight-lipped about her rumoured pregnancy, the singer appeared to dispel speculation by posting a photo of her and her husband - real name Shawn Carter - enjoying a bottle of wine last week. 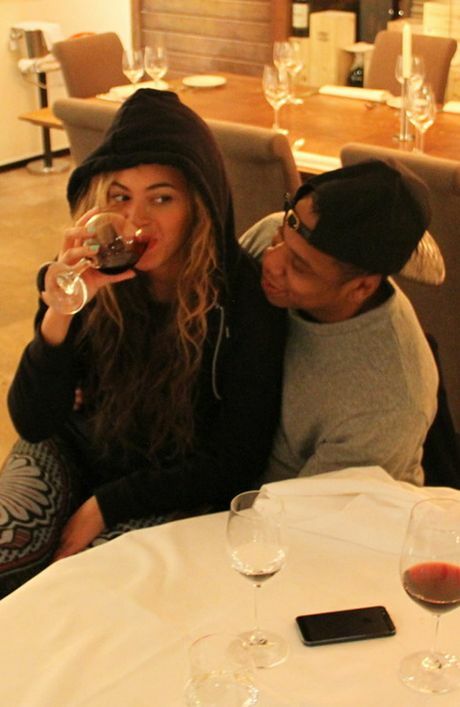 In the snap, Beyonce can be seen sitting on Jay's lap as she takes a tall sip from her wine glass while the 'Run This Town' rapper watches on. The musical couple surprised audiences with a rare on-stage collaboration during the Sound of Change gig at London's Twickenham Stadium on Saturday when Jay joined Beyonce on stage to perform her hit song 'Crazy in Love'. Beyonce was the headliner at the event and one of the co-founders of the Chime for Change charity - along with actress Salma Hayek and Gucci creative director Frida Giannini - which aims to empower women across the world.